New to our dynamic family of professional scuba diving interns in Kota Kinabalu is Tiago, a student from Portugal. Tiago joins us with just 4 dives under his PADI Open Water Diver belt and, over the next month and half, will be working towards becoming a PADI Divemaster. All Downbelow’s interns get free, unlimited diving and because we’re based on Gaya island, which is just 10 minutes by boat from Kota Kinabalu, we dive every day. This is good news for Tiago, because he will be able to increase his logged dives in no time. A certain number of dives are required for particular stages in the Divemaster internship. Between our lagoon being accessible via shore dives and our scheduled boat dives, Tiago and our other interns can literally dive as much as their bottom time allows. 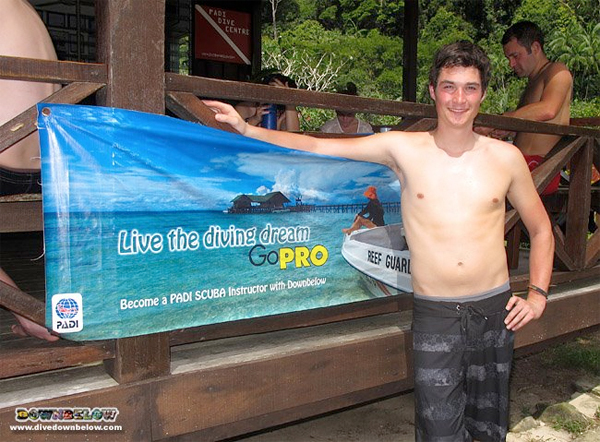 Keep an eye on Tiago’s evolution as he turns into a professional Divemaster with Downbelow. We’ll update here and on our IDC Asia blog.